WHOA. 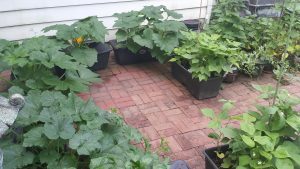 So for the last several years, I’ve struggled with my garden. Nothing much has grown. I’d plant beans, and we’d get a few, but really only enough for a couple of side dishes for meals. I’d plant peas, and I’d see a few sprouts, but we got like one pea. I planted tomatoes, eggplants, green peppers…nothing really grew. At least, not much. I was discouraged. Until this year, when I tried soil amendments. This year, I was determined. I resolved that I would have a successful garden this year. So I bought coconut coir, biochar, fertilizers…I studied up on companion planting and tried to plan my garden so that complementary plants would grow next to one another. 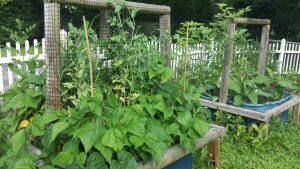 I spent a lot of time thinking about my garden this year. And finally…success. The soil amendments and smart planning paid off. 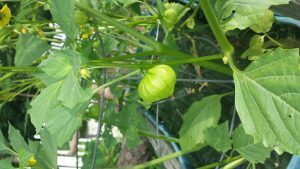 Look at my pretty “lanterns!” Tomatillos! I’ve planted tomatillos twice in the last several years, both times with limited soil amendments, and I didn’t get a thing. Not even a flower. This time, I have an obscene amount of tomatillos. What will I do with them all??? Can them, of course. Make tomatillo ketchup, which, incidentally, is heavenly. I’ve planted tomatoes for years, and they did okay, but not great. This year, I saved some eggshells up ahead of time, crushed them, and added them in the holes with every tomato plant. Homemade soil amendments rock! Every tomato plant has thrived and they all have tons of blossoms and tomatoes growing. You can also see some of my soup bean plants growing in the corner of this photo. It’s so exciting! I don’t care how old I get or how much gardening success I have in my lifetime, I will never get tired of the magic of planting a seed in the ground and seeing it grow into a food-bearing plant. What a wonderful, exciting thing to experience. So: soil amendments. Customized to the plant, specific for the needs, timed throughout the season. It makes all the difference.